The order entry system allows you to enter sales and purchase orders, and quotes for customers. As goods or services are supplied, the orders are turned into invoices, with any goods outstanding remaining on backorder. When you make a purchase of goods or services and where there is a delay between ordering the items and the receipt of those items, the details of the purchase should be recorded as a purchase order. When the items are finally delivered, you should check the pricing against the original order, and enter the quantity actually received. When you “process” this, MoneyWorks will automatically create a creditor invoice, and if necessary update your stock. Any items not delivered will be held as back-ordered items. If, as sometimes happens, the items are received before you get the invoice, you can receipt the items into stock and process the invoice later. A new transaction window will open. Pressing Alt-Shift-8/Ctrl-Shift-8 is a keyboard shortcut for this. The Purchase Order entry window will be displayed. The supplier name details will be entered automatically, as will the Purchase Order number. If you do not enter a valid supplier code, the choices list will be displayed when you tab out of the field. Use this to find the correct code or to create a new one. Depending on the design of your purchase order form, this may appear as an annotation on your printed purchase order. You need to record details of each item that you are purchasing. This is done in the detail lines of the purchase order. You need to record at least the quantity and code of each product required. In addition it is a good idea to put on the expected purchase price—the product description and price details are entered automatically for you when you enter the product code. This is your own internal product code or the item’s barcode—the Supplier’s Product Code (if it exists) will be printed on the purchase order. If you enter an invalid code (or leave the code blank), the product choices window will be displayed. You can choose the product from this list, or click the New button to record details of a new product. The product description and price will be entered automatically for you. The purchase price is taken from the product record, and (unless it has been altered) is the last price paid for the item. If freight is to be included as part of the purchase price, you should specify the expected freight charge in the freight area. In some situations you won’t know this, so enter it when the goods invoice arrives. Further processing of the order (for example, recording a deposit) can be activated at this point by using the Process Order pop-up menu at the bottom-left of the entry screen. The options in this are discussed later. Set the Printer icon to print an order form when you save the order. The printer icon will be displayed on the Next and OK buttons, indicating that the purchase order will be printed immediately one of these buttons is clicked. If you had elected to print this purchase order, the Print Form window will be displayed. Ensure you set the form to the desired purchase order, then print it. If you clicked the Next button, a new purchase order entry screen will be displayed, otherwise the purchase order list will be shown (with the current purchase order highlighted). If you clicked Cancel, the purchase order is not saved. 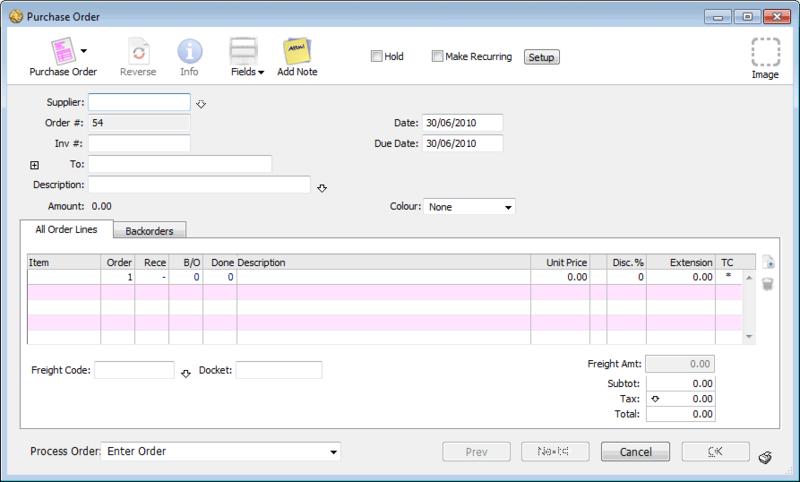 If the order is incomplete (there are backordered or unbilled items) it will stay in the Purchase Orders view. Once all the goods ordered have been received and billed, the order will move to the Bought view. When you re-open the order, you will see that the previously receipted quantities of goods have been transferred to the Done column. The remaining backorder quantities show in the B/O column, and for your convenience are also entered into the Receive column for the next shipment you receive. Note: Purchase orders are not accounting transactions, and hence they can be modified or deleted at (almost) any time.